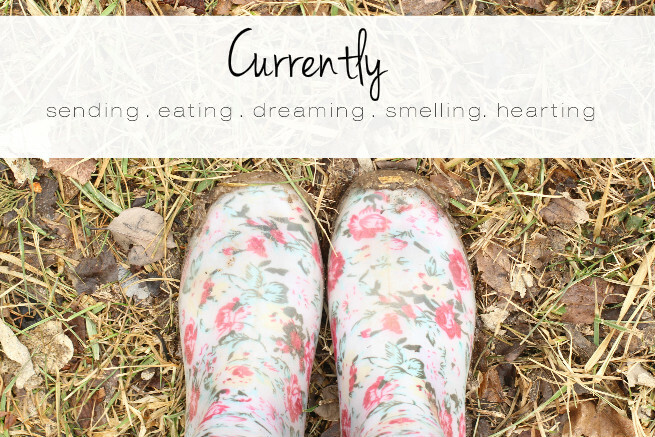 Each month Jenna and Anne do a currently link up and I love reading everyone's posts. I haven't been able to join in like I want in the past but today I am because I'm back in the land of internet and I have the time! Wahoo! I am working on sending thank you cards to people that we met along the trip. I know you can send an e-mail but there is just something special about hand written cards. I'm also working on getting birthday presents in order. In February and March there are four birthdays so I'm working on all of that. It takes my brother 3-4 weeks to get a package on the boat so I need to send his asap. A lot of good American food! It's so nice to eat food that won't make me sick. What have I been eating the most of? That would be green chiles from New Mexico! Seriously! It is so good. I ate a ton of while I was there and then I bought more to take home and we've been eating that. We have also been eating a lot of soup and tonight I plan on making blueberry lemon rolls. Yummo! I've also been eating things off the floor. ha! Let me explain. A while back I stopped at Panera for a quick bagel and soup and after toasting my bagel I dropped it on the floor. I stood there and thought "Hey, that is still probably cleaner than most of the food I ate in Burma so I bet I can still eat that." I then picked it up and ate it. I didn't get sick either so I guess I have Burma to thank for that one. That is just an example of what living in a 3rd world will do to your perspective. I'm dreaming of finding a home to live in! Yes, Dave will get a job before we get housing but I have been looking on-line a lot and researching things about homes. I'm really excited to settle in some where and be still for a while. I'm also really looking forward to spending time not only with family and friends but doing a few different ministries here in town. Dave and I are brainstorming and praying about possibly getting involved with international students. There are a few kids we would like to mentor and I'm thinking about and praying about doing photo sessions for the new born babies of the group home I used to work at. Of course, that is all pending that we live in Wichita. If we don't then God will open ministry doors for us wherever He leads us. Dave and I are farm sitting so we are smelling hay, alfalfa, pigs, horses, cow chips and more. The She Reads Truth devotional about Hymns. It is a short 5 day plan but The Bible and the devotional is something God is using to speak right to my heart. I'm so thankful for it. Also, I'm hearting this cute ring I got in Santa Fe, NM from the nicest lady named Laura. She makes all her own jewelry and was also a Christian. It was fun to visit with her and to help her small business. What you been up to currently? What have you been hearting? Oh my goodness!! Farm sitting?! How much fun!! I would love to farm sit for someone, now I just need to know someone who owns a farm!! You February looks wonderful! Happy house hunting! I laughed out loud at your bagel story! HI! Found you via the linkup and glad I did! Excellent blog and I love the She Reads Truth Devotions as well. I blog over at www.ourhomehisheart.com and I write weekly devotion posts if you ever want to stop by :) Keep up the great work and I will be checking out more posts from you! UM GREEN CHILES, A HOME, AND MINISTRY... amen to all of that sister! Especiallly the green chiles ;) I think your story about eating the bagel off the Panera floor is hilarious and I'm planning on telling Alex. We have this long standing debate about the presence of germs as they relate to development of allergies (my side: more germs = less allergies, and he's the opposite), so this story just makes me laugh :) I've done the SRT hymns devotional and it is wonderful! Can't wait to hear more about how you guys settle back in!